Set out as many Survey Team cards as players, face up in the center. Put the rest back in the box. For your first game , randomly give each player one of the four preset hands of 5 cards, marked A, B, C, or Din their upper right and lower left corners. Shuffle the remaining game cards to form the draw pile. 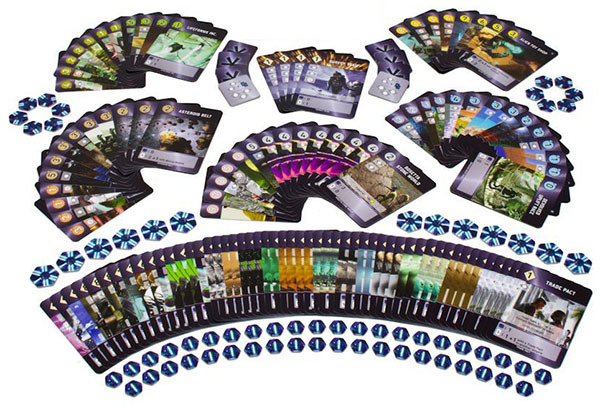 In later games , shuffle all game cards and deal each player 7 cards. Players each choose 2 cards to discard face down, ending with an initial hand of 5 cards. Put the victory point (VP) chips and Explore markers nearby. A game typically consists of 6 or 7 rounds. Each round, players simultaneously place cards face down (or Explore markers). 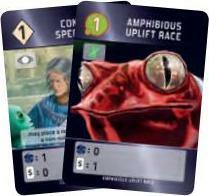 Players then reveal and pay for their cards, adding them to their empires. Place 1 development ( ). Discard 1 fewer card when paying for it. Place 1 world ( or ). After paying for or conquering it, draw 1 card. Place 1 development and 1 world. Pay full cost. Do not draw a card. 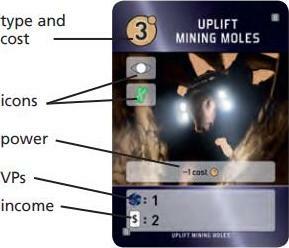 Or, instead of placing any cards, place an Explore marker and draw some extra cards (see Explore below). 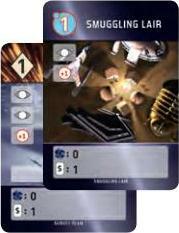 Players then score all their empire cards. If no one has 50+ VPS, players draw as many cards as their incomes and begin the next round. Each card lists its type, cost or defense, VPS, income, possibly a power, as well as up to three icons: either explore , military , or chromosome . Explore icons affect the Explore action. Military is used to conquer military worlds. All icons also affect various cards' powers, VPS, or income. Some cards refer to certain colors of worlds in your empire (see icons at right). Non-gray worlds are blue, brown, green, or yellow, representing production associated with Novelty, Rare Elements, Genes, or Alien Technology goods. Important: duplicates of cards - except Survey Teams or Trade Pacts - can be placed in a player's empire. Most power effects are cumulative. The cost to place a card is the black number inside its diamond or circle. (Worlds with red outlined numbers are placed differently. See below). To pay a cost, discard as many cards from hand as that number, placing them face down in the discard pile. A cost might be reduced by discounts, but not below 0. Once per game, you may place a Survey Team from the center instead of a development from hand, paying its 1 cost normally (discarding no cards if you did not also place a world). A military world with a red outlined number, its defense, must be conquered when placed (exception: Contact Specialist). To conquer a military world, a player does not pay any cards, but must have as least as many military icons as the world's defense (or powers that add enough extra military to equal or exceed its defense). 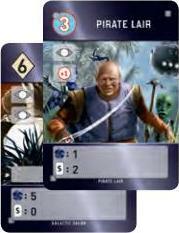 Some card powers provide military only towards conquering certain colors of military worlds or REBEL military worlds. A player may not combine military and payments to place worlds. A Contact Specialist allows a player to place non-Alien military worlds as non-military worlds by paying for them instead (at -1 cost). The Colony Convoy and Military Convoy each allow a player to place a second world of the same type in a round (but not more than two worlds). Second worlds are placed after revealing cards and paying for or conquering them (but before scoring). If a player drew a card for not placing a development, this card could be placed as a second world. A Colony Convoy may be used on a later round than the one in which it is placed. It cannot provide a discount for the first world placed in a round. It may be combined with a Contact Specialist. A Military Convoy cannot be used after placing the first world in a round with a Contact Specialist. A player who cannot or chooses not to place any cards instead places an Explore marker. He draws 2 cards, plus as many cards as the number of explore icons in his empire, including the 3 icons on the Explore marker itself, and adds them to his hand. He then discards as many cards as his explore icons (for a net gain of 2 cards) and flips the Explore marker to its * side. He then scores and takes income normally. Collect VPS for every card in your empire as shown on the card. Some cards produce varying VPS or income for certain icons or card types in your empire. Duplicate cards do this multiple times. Some cards produce VPS for certain icons or card types in your empire and in one other player's empire of your choice (see right). Some cards produce extra VPS or income "with" the presence of a specific card or card type in your empire. Having additional copies of the specified card or card type does not increase the amount received. Put each round's VP chips beneath the card(s) or explore marker you placed. This makes it easy to calculate next round's VPS by adding the VPS that your new cards provide to this amount and collecting this total. If any player has 50 or more total VP chips, the game is over. The player with the most VPS wins! If there is a tie, the tied player with the most cards in hand plus total income wins. If still tied, these players share in their victory. 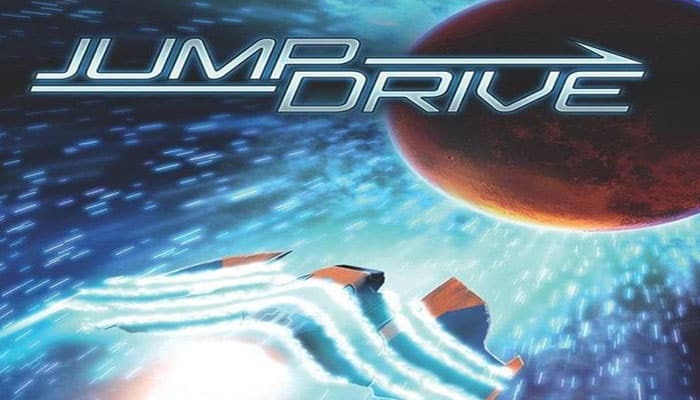 If the game is not over, collect income and begin the next round. When the deck is close to being exhausted, give income first to the player with the most VPS and then clockwise. If several players are tied for most VPS, begin with the tied player closest clockwise from the dealer during setup. Reshuffle the discards to form a new draw pile once the deck is exhausted. After all players have collected income, players with more than 10 cards in hand must discard down to 10 cards in hand. Round 1: Joe takes a Survey Team from the center and places a card face down. After the other players are ready, he flips it over to reveal a Smuggling Lair, a 1 defense world that Joe can place with the Survey Team's 1 military. Joe then discards 1 card to pay for the Survey Team and draws 2 cards income, ending at 5 cards in hand. Round 2: Joe places Consumer Markets , discarding just 1 card for it (not 2), as he did not place a world this turn. He earns 1 VP this round and his income increases to 3. He ends with 6 cards in hand. Round 3: Joe reveals Survey HQ , discarding 4 cards for it. Since Joe did not place a development, he then draws 1 card. He earns 2 VPs for his 2 pairs of , plus his Consumer Markets VPs increase by 1 since he placed a Novelty world. He adds these 3 VPs to 1 VP earned last round and collects 4 VPs this round, plus 6 cards income. Round 4: Joe spends all his cards and uses his increased military to place Galactic Salon and Pirate Lair. This increases his VPS by 9, with 1 more from Consumer Markets and 2 more from Survey HQ. Joe collects 13 VPs, giving him a total of 18 VPs. His income increases by 5, so he draws 11 cards and discards 1, due to the hand limit of 10 cards.